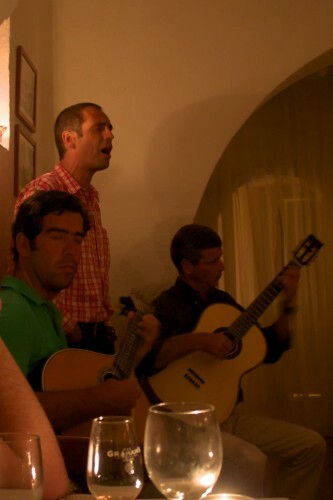 A popular evening past time in Portugal is to enjoy local cuisine with the national folk music, called Fado. We included a night of Fado on the trip itinerary we lined-out before we left. At that time, however, we had know idea that the experience would turn-out to be a trip highlight. Our original plan was to see Fado at a restaurant that specializes in performances. Guidebooks include a list of restaurants with Fado every night, mostly in the Chiado and Alfama neighborhoods. However, at the recommendation of our hotelier, we decided to go to a traditional Portuguese restaurant, called Guarda-Mor, that focuses on serving good food, but brings in Fado singers once per week as a special treat to their customers. We really lucked-out with the recommendation. Our dinner was one of the best meals of the trip and experienced an absolutely captivating Fado performance.Our reservations at Guarda-Mor were at 9:00 pm. After arriving, we realized we were one of only two non-local couples (which is usually a good sign). After a bottle of vinho verde and our meal, we were surprised to see the other non-local couple leave. After asking our waiter, we learned the Fado performance was delayed due to a missing guitarist, but we were assured they would find a replacement. We ordered another bottle of vinho verde, and around 11:00 pm, two singers and two guitarists arrived. The lights were turned-off, leaving the small dining area illuminated by candlelight. The guitars began to strum, and the enchanting voice of the male singer filled the room. Although the songs were in Portuguese, we could feel what the melancholy in the songs–which were perhaps about lost loves or old memories. On the third song, the rest of the audience began to sing along, suggesting to us that it must be a popular song. The female performer followed with her own 3 songs with a similar tone. The sound, lighting, space, and wine all worked together to dazzle our senses. We couldn’t get enough, and were concerned when the lights were turned back on after 6 songs, indicating a possible end to the night. To our delight, the interruption was just an intermission. We not only enjoyed another 6 songs, but also witnessed a guest singer finish-off the night with his own performance. We left Guarda-Mor with a great appreciation for Portuguese folk music. We will certainly return on our next trip to Lisbon. For other visitors to Portugal, we strongly recommend spending a night at Fado, especially if you can find an authentic venue such as Guarda-Mor. This entry was posted in Travel and tagged experience, Lisbon, Portugal, Portugal/Spain 2012 Trip by Ryan. Bookmark the permalink.